Researchers from the Tübingen collaborative research center Resource Cultures (SFB 1070) have uncovered the remains of a previously unknown Copper Age settlement in the central Spanish region of Azután. Working with colleagues from the University of Alcalá de Henares, they found shards and stone tools over an area of around 90 hectares. Typological analysis placed the finds in the Copper Age or Chalcolithic period – the transitional era after the Stone Age before metallurgists discovered that adding tin to copper produced much harder bronze, 4,000-5,000 years ago. 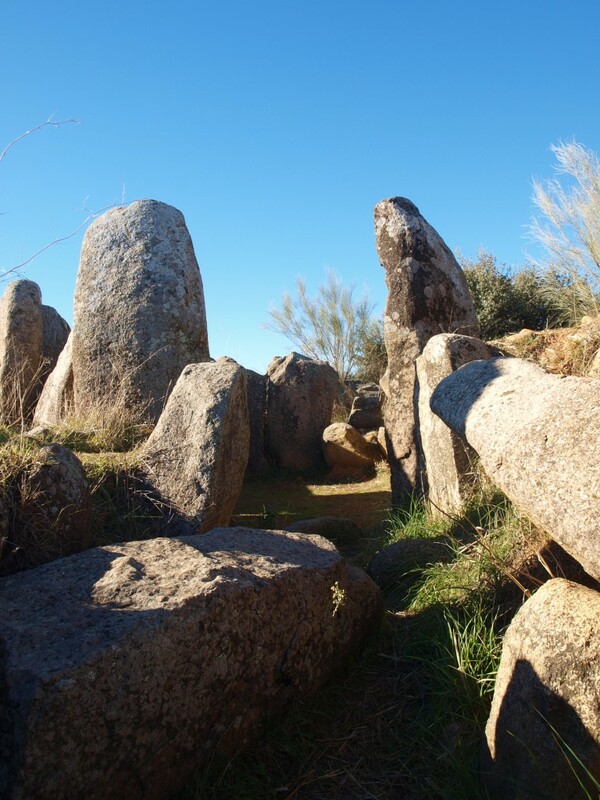 The Iberian Chalcolithic is marked by large fortified settlements in the southwest and more intensive use of natural resources than in the Neolithic period. It was believed that the central region around Toledo had been settled only sporadically at that time, as it is hemmed in by two mountains ranges, between which the River Tajo runs – and it would have been hard to cross 4,000 years ago. Today, the megalithic grave chamber of Azután (pictured) still hints at Chalcolithic settlement. The volume and concentration of the latest finds point towards large, long-term settlements in the region in the fourth and third centuries BC. The researchers, headed by Tübingen archaeologist Martin Bartelheim, took geomagnetic soundings and plan to compare those results with aerial photographs of the site to identify the size and structure of the settlement. “With the new finds at Azután, we can confirm that there was intensive copperworking and settlement also in central Spain. Until now, it was thought that such activity was mostly limited to the fertile coastal regions in the south of the Iberian Peninsula,” says Felicitas Schmitt, a PhD student in the Resource Cultures collaborative research center. At nearby Aldeanueva de San Bartolomé there is another, possibly fortified settlement, which shows signs of having been an early copper processing site. Ancient millstones and weights for nets recently found around Azután point to agriculture and fishing – and a division of labor, which marks a step along the road to the development of professional trades. The researchers plan to trace the ancient trade routes across Spain via landscape surveys. Even today, the site is close to major roads along the river valley, and running across them are paths into the hills used by shepherds; such routes have crossed the Meseta since time immemorial.